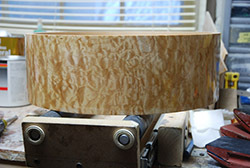 Carolina Drumworks snares are built using three categories of shell materials: solid woods, plywoods, and some metals. Within each of those, we limit our materials to choices that provide excellent acoustic properties and pleasing visual appearance, adhering to our standards of tone and beauty. Our Gold Series drums are made with solid hardwoods, in steambent, stave, and segment construction. We have also have built out several true solid shells as custom projects, although we do not normally offer those due to tonal variance and potentially delicate structure. Domestic -- Ash, Beech, Cherry, Curly Cherry, Hickory, Birdseye Maple, Curly Maple, Hard Maple, Quilted Maple, Walnut, and Claro Walnut. We have also built with Pine, although it's a softwood, and Poplar, but don't normally offer those. Our Silver Series drums are made using same-species plywood shells, occasionally with outer veneers to enhance appearance. We do not build with multi-species shells. Wood species we have offered in plywood include Birch, Cherry, Maple, and Walnut. We also offer snare drums incorporating metal shells, including Aluminum, black nickel plated Brass, and 220 Bronze.